This paper summarises activities from the iCLEF 2008 task. In an attempt to encourage greater participation in user-orientated experiments, a new task was organised based on users participating in an interactive cross-language image search experiment. Organizers provided a default multilingual search system which accessed images from Flickr, with the whole iCLEF experiment run as an online game. 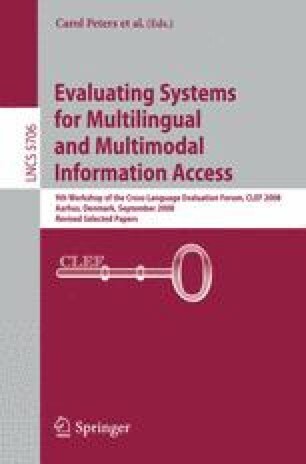 Interaction by users with the system was recorded in log files which were shared with participants for further analyses, and provide a future resource for studying various effects on user-orientated cross-language search. In total six groups participated in iCLEF, providing a combined effort in generating results for a shared experiment on user-orientated cross-language retrieval.